Temetrius Jame Morant, professionally popular by the name Temetrius Morant or Ja Morant is an American college basketball player. He currently plays for the Murray State Racers of the Ohio Valley Conference (OVC). He plays in Point guard/Shooting guard position. Following his amazing talent and skills, he is considered one of the top prospects and a potential top-three pick in the 2019 NBA draft. He has garnered over 373k followers on his Instagram. What is Murray State known for? Considered one of the top prospects for the 2019 NBA draft. 2019 OVC Player of the Year. Where is Ja Morant from? Ja Morant was born on 10 August 1999. His birth name is Temetrius Jame Morant. He was born to a Jamie Morant and Tee Morant. His birthplace is in Dalzell, South Carolina in the United States. He holds American nationality. He has one sibling, a younger sister, Teniya. His father also played professional basketball but quit playing basketball after Ja was born and became a barber. His father trained him basketball in his backyard. His father bought tractor tires for him to practice jumping with a soft landing. He played in the Amateur Athletic Union (AAU) circuit with the South Carolina Hornets. He was teammates with Zion Williamson. He attended Crestwood High School in Sumter, South Carolina. He became all-time leading scorer with 1,679 points at Crestwood. He set a career-high record with 56 points against Sumter High School. He averaged 27 points, 8 rebounds, and 8 assists per game in his final two seasons for Crestwood. He earned Carolina Class 3A All-State honors in both years. He completed high school as a three-time All-Region Most Valuable Player (MVP). He was not ranked by recruiting services and got his only high major NCAA Division I offer from the University of South Carolina. Duquesne, Maryland Eastern Shore, South Carolina State, and Wofford also offered him scholarships. Morant was playing a three-on-three game in an auxiliary gym. Assistant coach James Kane who was attending the camp noticed Morant playing when he was looking for a snack. James Kane then contacted head coach Matt McMahon and offered Morant a scholarship. Thus, he was discovered by mid-major program Murray State of the Ohio Valley Conference (OVC). He then represented Murray State Racers men's basketball team at the University of Murray State. He averaged 12.7 points, 6.5 rebounds, and 6.3 assists per game in all 32 of his games in his freshman years. He posted his first triple-double in December 2017 against Eastern Illinois. He posted 11 points, 10 rebounds, and 14 assists which were the only second trip-double in school history after Isacc Miles in 1984. He earned first-team All-OVC and OVC All-Newcomer Team accolades. He became the key player for Murray State after Jonathan Stark and Terrell Miller departed. He was named to the midseason top 25 watch list for the John R. Wooden Award in January 2019. He broke the school record for most assists in a single game with 18 assists against UT Martin in January 2019. He broke the OVC record for most consecutive free throws made in a game. He also became the first NCAA Division I men's player in 20 years to tally at least 40 points, 10 assists, and 5 steals in a single game against SIU Edwardsville in January 2019. He broke the school single-season assist record of 212 set by Chad Townsend in the 1996-67 season. He became the 46th Murray State player with 1,000 career points. He also eclipsed the OVC record for single-season assists. The record was held for 32 years by Duane Washington of Middle Tennessee. He was named OVC Player of the Year and earned first-team OVC. He led the team to win OVC Tournament title defeating Belmont. He was named the tournament's MVP. He was named a member of the USBWA's All-American First Team and Sporting News' All-American Second Team for his performances at Murray State. He scored his third triple-double of the season against Marquette with 19 points, 16 assists, and 12 rebounds in March 2019. He became the eighth player to ever record a triple-double in the NCAA Tournament. He is projected as a top-five selection in the 2019 NBA draft. 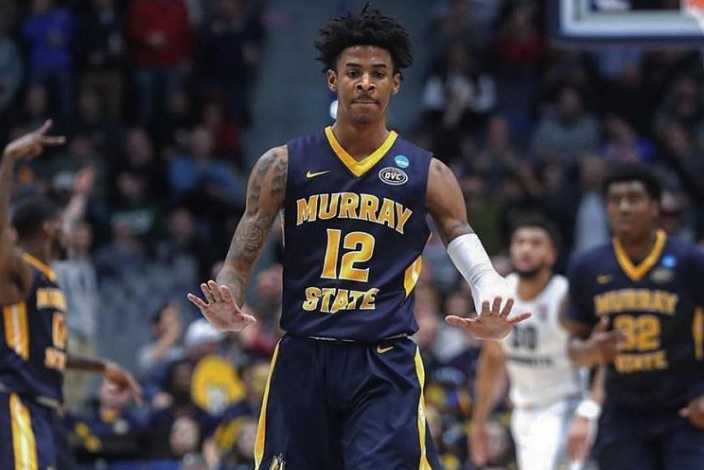 Who is Ja Morant Dating? 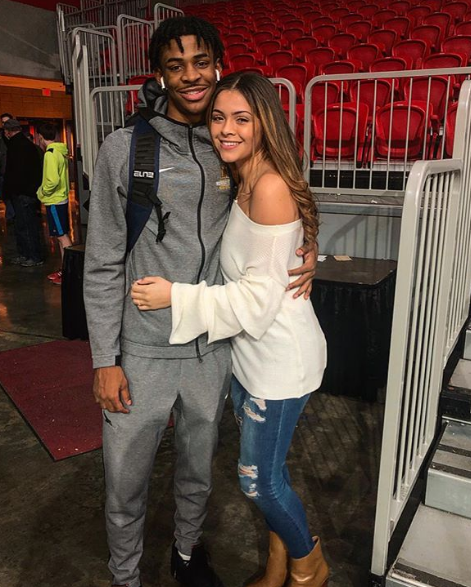 Ja Morant is reportedly in a relationship. He posted a picture with his girlfriend on Valentines Day this year. The couple is living a healthy relationship. As he is very young, he is dedicated to his basketball career. He is considered one of the top prospects for the 2019 NBA draft. He has a tattoo "beneath no one" written on his left arm. His mother advised him those words. How Tall is Ja Morant? 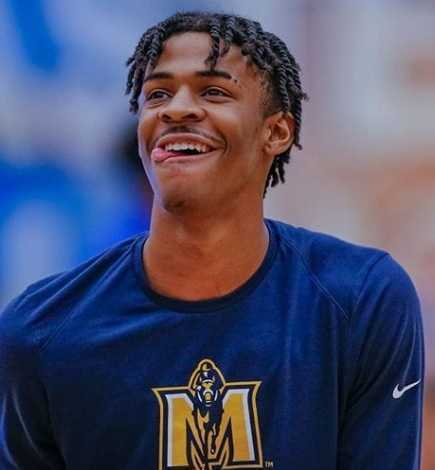 Ja Morant stands at a height of 1.91 m i.e. 6 feet and 3 inches tall. He has a body weight of 175 lbs i.e. 79 kg. He has an athletic body build. 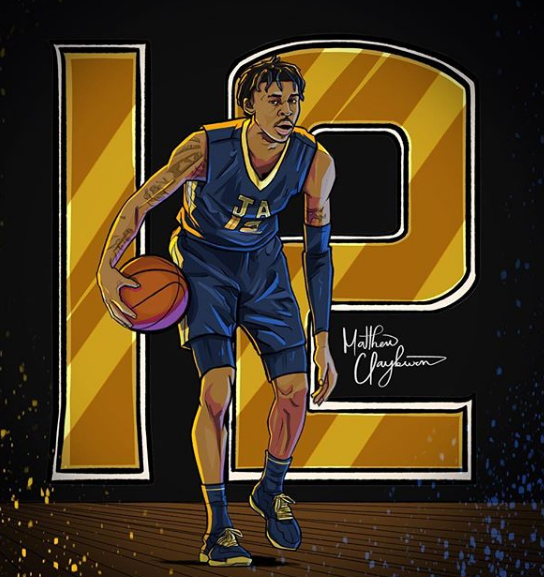 What is Ja Morant's Net Worth? Ja Morant is a young emerging college basketball player. He has established himself as one of the top players in the University of Murray State. He is considered one of the top prospects if the 2019 NBA draft. He has yet to display his skills as a professional player. He has a long future ahead of him in NBA. He will be earning quite a fortune in the coming years. His father also played professional basketball. He could not dunk until he was a senior. He and his sister grew up playing basketball with their father.